Prominent & Leading Service Provider from Pune, we offer airmagik hvac system, airmagik air handling units and pre-filters. 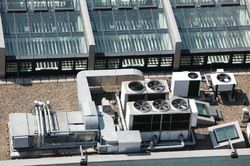 HVAC is an important part of residential structures such as single-family homes, apartment buildings, hotels and senior living facilities, medium to large industrial and office buildings such as skyscrapers and hospitals, onboard vessels, and in marine environments, where safe and healthy building conditions are regulated with respect to temperature and humidity, using fresh air from outdoors. The capacity of the air handling unit is 1000 CFM to 10000 CFM. The standard version of these units includes galvanized metal sheet, extruded aluminum frame, PUF insulation. Some of the optional features include thermal break construction, louvers, supply air grilled plenum, instrumentation and control. The vertical air handling unit finds applications in many public offices, shopping malls and multiplexes. Techpanacea’s Airmagik AHU works in line with the procedures and expectations with the Eurovent Certification Program for Air Handling Units. Eurovent Air Handling Unit (WDEV) can be better understood through the Eurovent Certification Program which evaluates the results and gives the Eurovent Certificate accordingly. 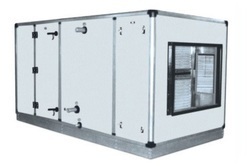 Similarly, Eurovent Air Handling Unit (WDEV) takes due care of the quality aspect. The pre-filters are filters composed of a progressive structure of 100% polyester synthetic fibers suitable for low to medium efficiency air filtration in HVAC systems (heating, ventilation, air conditioning, air cooling); pre-filters are also used in the pre-filtration in spray paint booth systems and for the abatement of the overspray. Our MERV 13 rated pleats from Koch Filter Corporation is rated according to ASHRAE 52.2 standards and 80% to 85% efficient according to ASHRAE 52.1 standards. The low airflow resistance results in reduced energy consumption and lower energy costs. Fiberglass Disposable filters are still in use in some older residential HVAC systems. Although they do not offer a high degree of dust removal they do offer low resistance to assure proper air flow in low volume systems. Fiberglass Disposables offer the most standard sizes and can also be made to order in any size up to 72" long. Polyester/Glass Rolls and Pads Roll and pad media is designed for use in permanent metal frames. Media can be ordered in pre cut form or in rolls to me cut at the site. Internal Wire Panel Filter complete line of standard and special sized aluminum and stainless steel filters for use in both kitchen exhaust or HVAC systems. These filters are available in 1/2", 1" or 2" thickness to fit any home system.